My husband and I love appetizers. I think we really fell in love with the idea on our honeymoon when we were greeted with an appetizer platter at our spa hotel, and the variety of tasting platters that we got to enjoy as we traveled around Ontario wine regions throughout that week. Two years later, our affair with appetizer platters was still going strong when we'd saved up enough to visit the wine regions in Australia. But all of that was before our kiddo arrived, and his "selective" (toddler) eating habits. These days, we are always looking for fun finger foods that we will all enjoy as a family. So I decided to make a irresistible and easy empanada recipe that would be wonderful for entertaining over the holidays, would be the star of the appetizer show at any New Year's celebration, and would be toddler friendly (and nutritious to boot). No problem, right?! These empanadas are amazing. They have a unique flavour that is both a bit savoury and sweet, they are moist with a soft and flaky baked crust, and they will disappear in no time. The beauty of this recipe is that you can easily swap out the sausage for ground beef or ground chicken, as the seasonings and flavourings are so versatile, that a variety of meats would be delicious in this. What I also love about this recipe is that it packs a punch by adding in lots of mushrooms to my little guy's diet, that these are baked (not fried), and that they are really the perfect party snack - they can be held in one hand, with a drink in the other (or leaving you with a hand free to grab your toddler at a moment's whim). What are your favourite appetizers and entertaining recipes? Using a food processor, pulse the flour, shortening and salt until the mixture resembles sand. With the machine on, add the cold water in a thin stream until the dough forms a ball. Shape and press dough into 2 equal rounds. Remove sausage meat from casing. Cook over medium-high heat, stirring and breaking up, until browned (approximately 8 minutes). Drain the sausage meat of the fat, and place it on a plate with paper towel. 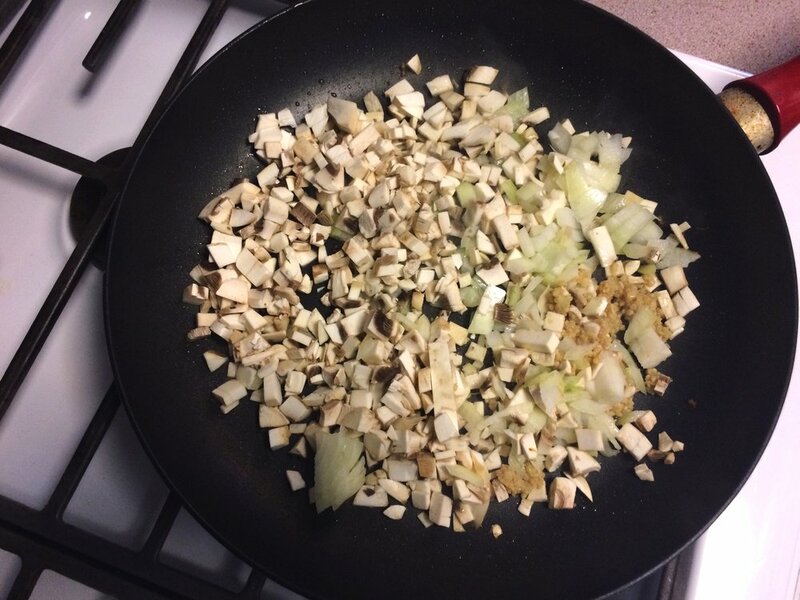 Cook onion, garlic and mushrooms over medium heat for 10 minutes, or until the liquid is evaporated. Turn heat down to low and add sausage back into the frying pan. Add salt, pepper, cumin, cinnamon, allspice & oregano into the sausage and mushroom mixture and stir until combined and seasonings are fragrant. In a small bowl, mix together tomato puree, cider vinegar and maple syrup and then add it to the sausage and mushroom mixture and stir until well combined. Turn the heat off and let the mixture cool for handling. Preheat the oven to 400F degrees and line two cookie sheets with parchment paper. Prepare egg wash by beating the egg and water together in a small bowl. On a generously floured work surface, roll out the dough 1/8 inch thick. With a 6-inch round cookie cutter, stamp out as many rounds as possible (you should have about 5-6 from each round of dough). Reroll the dough scraps and stamp out additional rounds if possible. Brush the excess flour off the rounds. Working with 1 round at a time, form the empanadas by spooning 1 ½ to 2 tablespoons of the filling on one side of each dough round. Put a bit of egg wash around the edge of the empanada to help seal it. Fold the dough over to enclose the filling and crimp the edges with a fork to seal. Divide the empanadas among 2 parchment-paper-lined baking sheets. Brush the empanadas with the remaining egg wash.
Bake until golden-brown, 18-22 minutes. Let cool for 15 minutes. Enjoy!